Bond 45 is located in the heart of National Harbor and is one of the first white table cloth eateries to open after the resort itself finally came in to fruition. 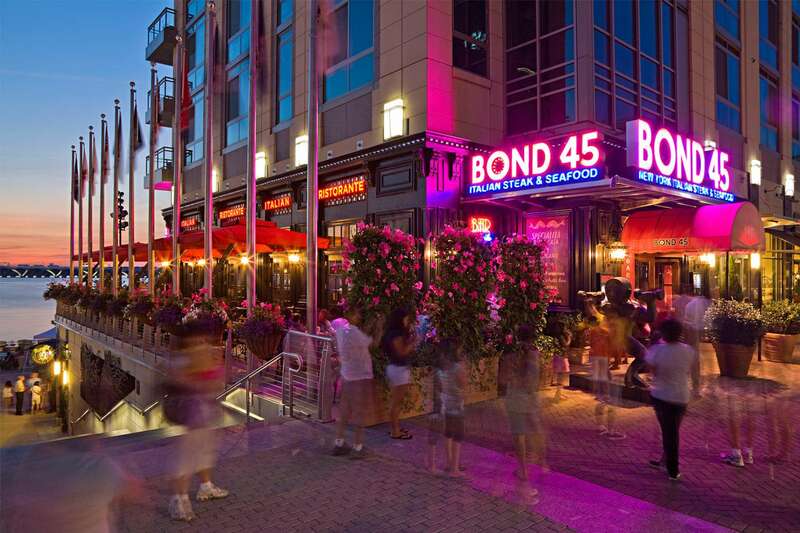 The original Bond 45 is a landmark located in the theater district in New York City and while we haven’t had the privilege to frequent the original, the National Harbor version is one of our favorite places in the Harbor. From the cool neon sign on the exterior to the rich, warm interior this restaurant exudes class. In addition to our favorite place to drink and dine – the extensive bar and front dining room – Bond has five private dining rooms that can host anywhere between 8 and 250 guests. There are also two balconies with outside seating that provide a great view of the Plaza, the Capital Wheel, the Potomac River and the Old Town Alexandria skyline. 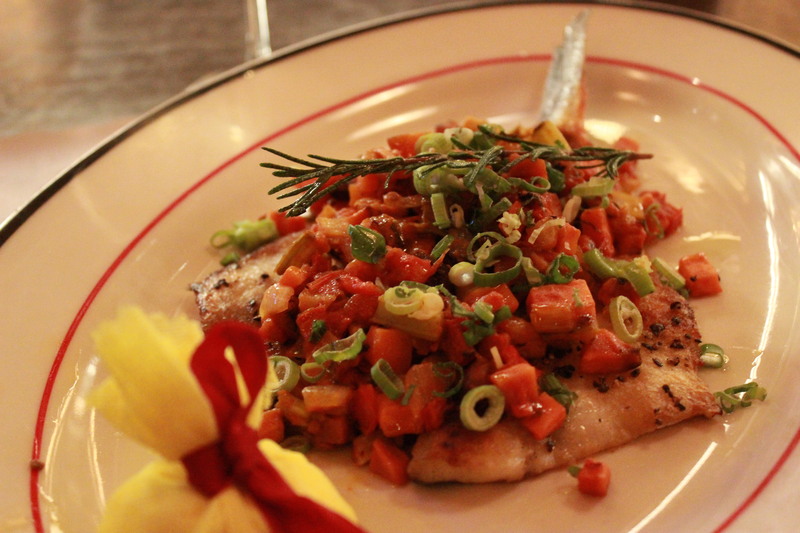 Steaks, pasta and seafood all reign supreme at Bond. For those readers who have already had the Bond 45 experience, I am sure that you have your favorite go-to steak cut and pasta. While the original menu was all inclusive and included a wide array of choices in all categories, it was a little overwhelming for me. The new menu that was just rolled out in mid-July is a nice change. There are still plenty of choices in all areas – 7 steaks, 12 house-made pastas, 7 seafood selections and 4 Italian classics the likes of Eggplant and Chicken Parmigiana, Chicken Marsala, Mamma Perla’s Chicken and a Veal Chop Parmigiana. The appetizers and salads are plentiful and the house-made meatballs are still a staple. They have a new Summer Chopped Salad that we tried that was over the top. We had a different sort of dining experience when we were there last month. They have added a “Family Style” section to the new menu that offers 7 appetizers, 6 pasta selections and 5 entrees. We decided to let our hosts pick two of their favorites this section. Fortunately for us, two good friends walked in while we were dining and volunteered to help us out. The family-style portions are advertised for 4-6 and those are generous portions. 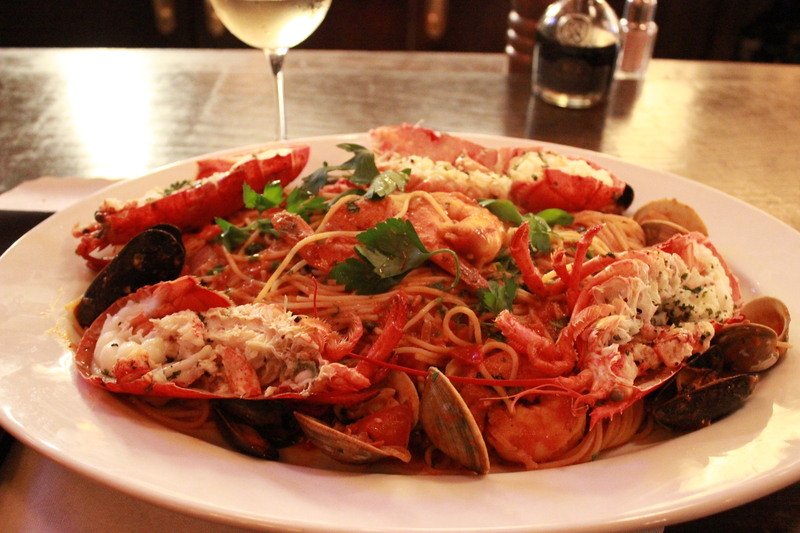 The centerpiece of our experience was the family style Spaghetti, Lobster & Seafood. Served on a large platter, this dish was chock full of jumbo shrimp, two split lobster tails, cherrystone clams and mussels. The pasta was tossed with the perfect amount of marinara (one of the best in the area) and served piping hot. The photo really does not do this dish justice – that platter is huge! Along with the platter, we sampled the summer chopped salad (see comment above) – little gem romaine lettuce, market vegetables, tomatoes, salami, fontina cheese, cucumbers and olives tossed in a house-made ranch dressing. We also sampled the Jumbo Lump Crab Cake & Shrimp combination and the Striped Bass Branzino with roasted vegetables from the “normal” entrée selections. We are both Maryland Crab Cake purists and while the Bond 45 version isn’t prepared quite like we prefer them, this crab cake was very, very tasty and a good size. The jumbo shrimp that accompanied it added an extra boost. The Branzino was very flavorful and the presentation was fantastic. The accompanying photo doesn’t really do it justice either. No steak was consumed on this visit but I have yet to be disappointed in any of the steaks that I have had over the last 6 or years. Serving New York steaks, dry-aged 28 days, ranging from an 8 ounce Filet Mignon and 14 ounce Rib Eye (my favorites) to a 36 ounce Porterhouse for two, Bond strives to make sure that you are never disappointed. One of our favorite things about the Bond 45 experience is the tradition of welcoming guests with a complimentary flute of Prosecco and saying good bye with freshly baked complimentary chocolate chip cookies! Not too many other restaurants extend that sort of hospitality. I can’t forget to mention the house made focaccia that they start you off with when you are seated either. This can almost be a meal on its own! Bond is also serving Brunch now. The menu has several breakfast favorites including eggs benedict (classic, crab cake and Florentine), steak and eggs, 2 kinds of pancakes (buttermilk and chocolate chip), tiramisu French toast, an Italian omelette and a three-cheese omelette as well as lobster scrambled eggs. Also on the Brunch menu are The Bond Brunch for $25 (eggs any style, Canadian bacon & Italian sausage, choice of potatoes or parmesan grits, toast, glass of orange juice or Prosecco, coffee or tea) and the Healthy Day for $20 (Greek yogurt, granola, hardboiled egg, seasonal berries, almonds, walnuts, glass of orange juice, coffee or tea). These are both a good value. Non breakfast items are also plentiful for those of you looking for more of a lunch. Also something very attractive to us is the Unlimited Bubbles for $18. This offer includes your choice of the Bellini – peach puree & prosecco, Puccini – raspberry puree & prosecco and the Risdini – strawberry puree & prosecco. Unlimited is the key word here. They also have $12 Bloody Mary’s – the classic and the bloody Italian that is made with San Marzano tomato juice. 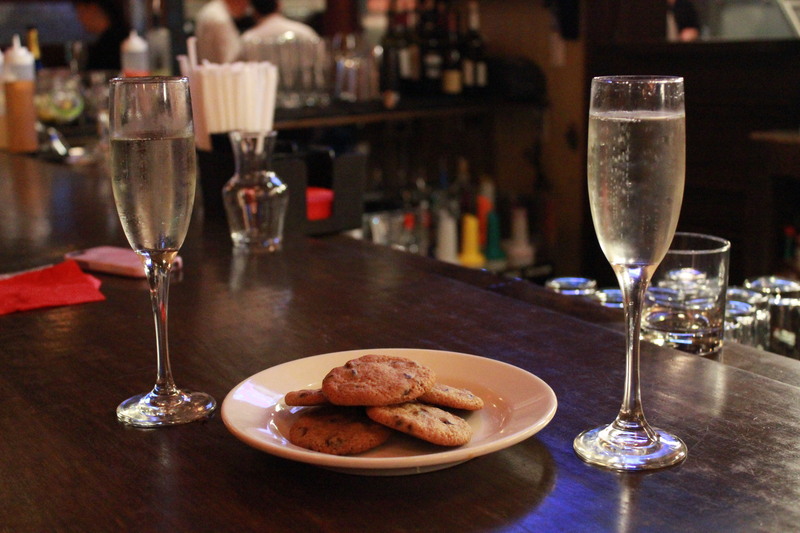 Bond has an extensive wine list and a full bar that can accommodate everyone’s adult beverage wish. The drink and wine pours are quite generous. Pricing at Bond is consistent with other establishments of this caliber in the metro area and there is both metered parking in front of the restaurant and garage parking a short walk away. Reservations are encouraged. « Meet Me At the Junction!